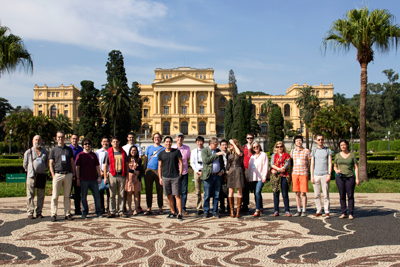 The relationship between the University of São Paulo and the city of São Paulo, the buildings and monuments that display the myriad architectural influences in the state capital, and an overview of the city’s social, economic and cultural history were presented to the participants of the Intercontinental Academia (ICA) on Saturday, April 18, during the project’s first activity. The activity comprised a 10-hour cultural and scientific tour downtown and in some neighborhoods of São Paulo. The tour was organized and expounded by IEA’s director, Martin Grossmann, together with the Institute’s deputy director, Paulo Saldiva, the director of the Museum of Contemporary Art (MAC), Hugo Segawa, and professors Eduardo Monteiro and Fernando Iazetta from the Music Department of the School of Communication and Arts (ECA), both accompanied by members of projects they coordinate. The participants were able to get a good feel of the history of São Paulo and its people since the founding of the city, with special emphasis on the growth and development brought about by the great age of coffee and the subsequent industrialization. The tour was based on the Giro Cultural project, designed by the Dean’s Office for Culture and University Extension (PRCEU) and coordinated by Grossmann. The itinerary included Independence Park, the Paulista Museum, the Monument to the Independence and the Museum of Zoology, all in Ipiranga district; Dom Pedro II Park, including the Palace of the Industries and the Municipal Market; the city center, including São João and Ipiranga avenues, Republic Square, the former premises of Caetano de Campos school, the Municipal Theater, the Copan building, the building of the School of Architecture and Urbanism in Maranhão street and the Maria Antonia University Center; the building of USP’s Medical School; Paulista Avenue; and the seat of the Museum of Contemporary Art in Ibirapuera Park. Grossmann explained how much the city was influenced, until the early decades of the 20th century, by the architecture of 19th century European palaces (the Paulista Museum and the Municipal Theater, for example), and how it later moved on to incorporate modernist values with the projects of Oscar Niemeyer, Lina Bo Bardi, Paulo Mendes da Rocha and other architects. The history of how the city was established and the collections of São Paulo’s major museums (MASP, MAM, MAC and Pinacoteca) were the object of detailed explanations by Grossmann, who also spoke about the creation of the São Paulo Biennial in 1951. During the visit to the Maria Antonia University Center, the participants were informed of the importance of the site as the former seat of USP’s School of Philosophy, Literature and Human Sciences, and as a one of the nuclei of resistance to the military dictatorship. They had the opportunity to hear an exposition by Eduardo Monteiro on the life and work São Paulo-born composer Alexandre Levy (1864-1892). Monteiro heads the Piano Laboratory of ECA’s Music Department, where he oversees a project to record all of Levy’s works. Monteiro’s talk was followed by the presentation of four of Levy’s pieces, performed by graduate and undergraduate students involved in the project. At the Medical School, Paul Saldiva explained the School’s role in the development of medical research in Brazil and the importance of the Clinical Hospital for providing health services to the city’s population. Saldiva also mentioned the perils to health and life in general in the daily life of a metropolis such as São Paulo – from the numerous motorcycle accidents to environmental hazards such as air pollution and sanitation problems. At the Museum of Contemporary Art, Hugo Segawa talked about the features and role of the institution within the University of São Paulo, the city’s cultural milieu, and the move three years ago to the building designed by Oscar Niemeyer. On the terrace on the eighth floor of the museum, the guests enjoyed a panoramic view of Ibirapuera Park and of the southern and western regions of the city, accompanied by explanations by Segawa, whose scholarly pursuits at the School of Architecture and Urbanism (FAU) include the history of natural landscapes, public spaces and public urban gardens. Also at MAC, participants listened to a performance by NuSom group. This group, from ECA’s Music Department, is dedicated to researches in sonology [the multidisciplinary study of sound]. Two pieces with audiovisual interaction and electronic resources were presented, and the group’s coordinator explained how they integrate various artistic and technological fields. On balance, the activity was extremely positive, enabling the first close contact between the ICA participants. During lunch, at an Italian restaurant (after the influence of Italian immigration in the city had been explained), one could already sense the closeness and the exchange of information: one young biologist, for instance, was soon discussing with a young mathematician, his table neighbor, about an idea he had had that involved biomathematics.